Jeff Glucker September 5, 2018 Comment Now! Bruiser Conversions loves the Jeep Wrangler. Not because of what it can do in factory-stock trim but rather because of what Bruiser can create with the Wrangler as its starting point. The company's latest modified masterpiece? 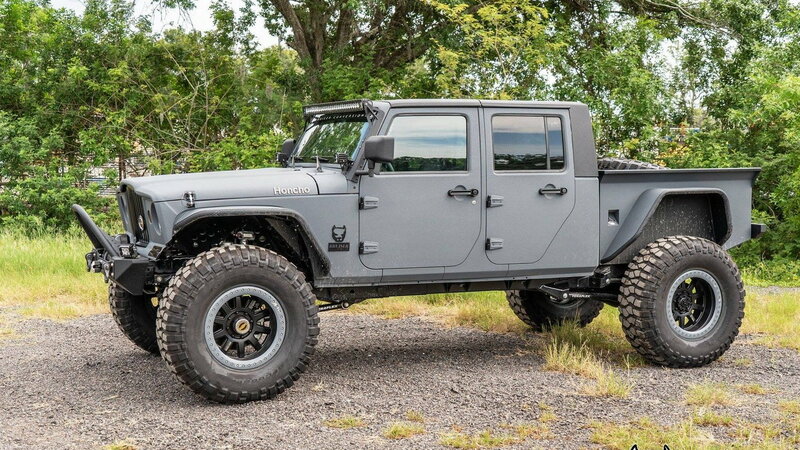 The Jeep Wrangler Honcho. 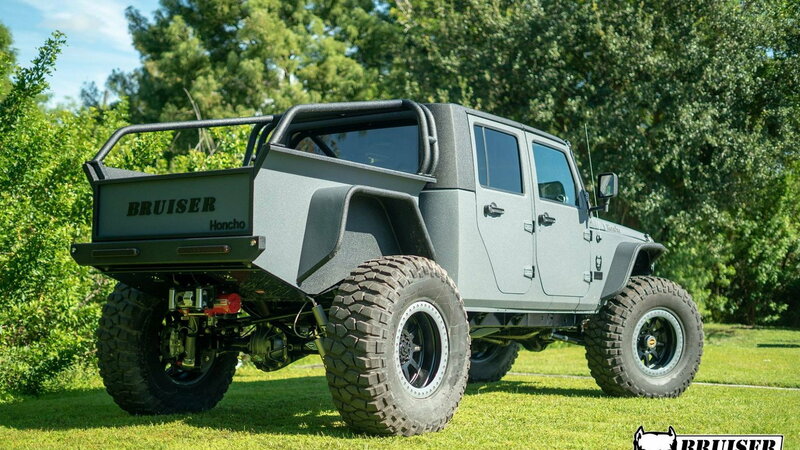 Using a JK Unlimited as the base machine, Bruiser Conversions transforms the rig into a Wrangler pickup truck. 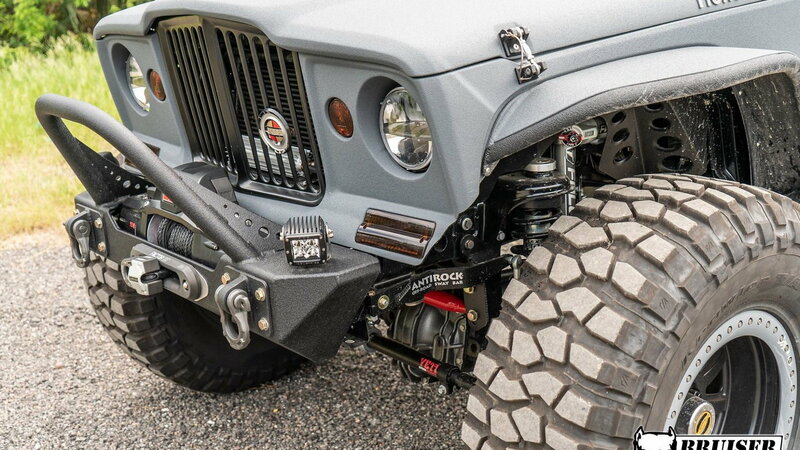 This isn't the company's standard JK Crew build, however, as the Honcho also boasts a retro-inspired Gladiator front clip, Honcho badging, and a lot more that creates a lot more capability. The most important upgrade is certainly the General Motors LS3 V-8 engine. Bruiser also offers the option to swap in a Cummins turbodiesel 2.8-liter inline-4 as well. The package starts at $40,000 over the cost of the Wrangler. That's crazy money but Bruiser supplies a crazy rig. In fact, the LS3 can be tweaked further over its stock output to produce 500 horsepower or even 690 hp, according to CarScoops. Beyond the engine, the Honcho boasts a bed-mounted roll cage, Dana 60 axles, beadlock wheels wearing 42-inch BFGoodrich tires, upgraded suspension, and enough auxiliary lighting to battle it out with the sun. At first glance, the nose is a bit jarring, but when viewed in full it starts to come together. 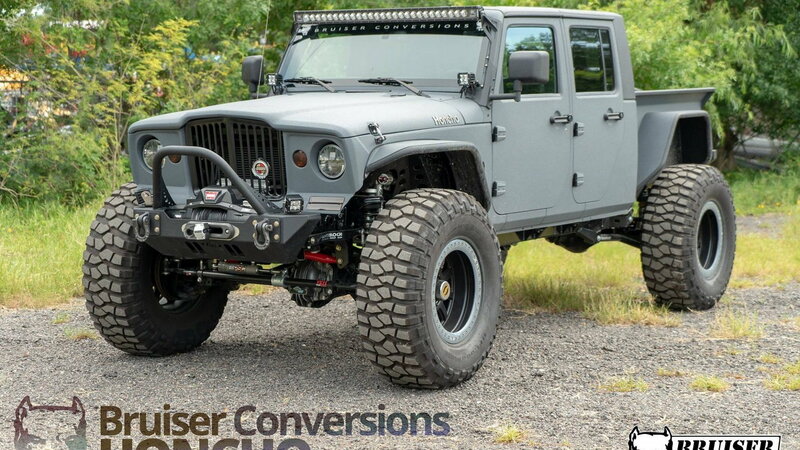 For anyone not up on their Jeep history, that front clip is modeled after the first-generation Jeep Gladiator pickup built from 1962 through '69. After that, the Gladiator wore the same nose as the Wagoneer. Does it work on the modern Wrangler? The Jeep is all about history and capability, so it works well, especially when paired with all of the parts that improve the vehicle's power and off-road prowess. From the V-8 under the hood to the go-anywhere suspension underneath, the Honcho looks poised for off-road battle. It's extremely expensive but wildly capable. And there's a strong possibility that there won't be another Jeep like it out on the trail. For some owners, that's as important as the specs.